Totally normal to have three mascaras on rotation right? There's something about applying mascara daily that I find really therapeutic. It's the make up step that pulls the whole look together and I feel kind of naked without it! The best mascara ever if you need something budge-proof because this is one of the only mascaras I have that never ever smudges or flakes on me. It's not a waterproof formula but it's a tubing mascara meaning that it coats your lashes with little 'tubes' that are removed with warm water rather than an eye make up remover. I have used a tubing mascara before and I wasn't impressed-I thought it was a pain to remove and I didn't get much effect on the lashes-but this mascara changed my opinion. The mascara wand is probably the most traditional fiber wand shape and it's quite small and precise. The formula is thin and not overly wet but is buildable and the lashes look nicely defined without looking OTT. Once dried, this mascara will not move-it even survives a spinning class with zero smudging. Removing it does take a little bit of getting used to but is weirdly satisfying. I tend to cleanse my face as normal and when removing the cleanser with warm water I gently pull at my lashes and the mascara 'tubes' come off. Both the Tarte and the Marc Jacobs mascaras are ones that have gotten better the more I have used them-I think as air gets into the formula it starts to dry out a little bit making the mascara a bit thicker. 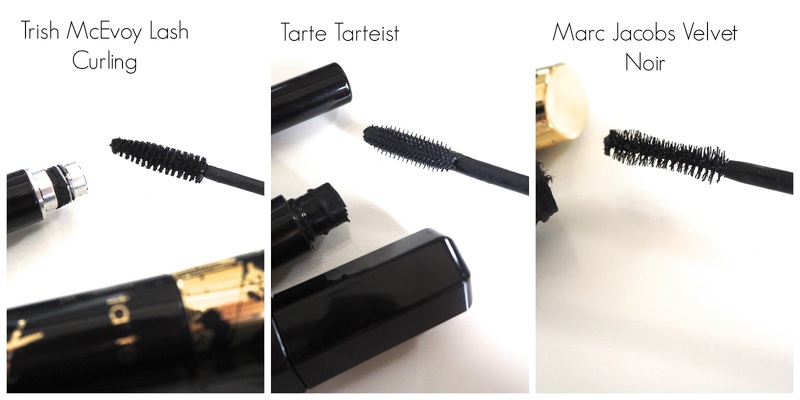 The Tarteist mascara gives a lovely look to the lashes-it adds volume and length that can be built up to drag lashes standard. However there seems to be a tipping point with this mascara where one coat too many ends up in a giant monolash so it's worth wiping off the excess from the wand and using it to comb through the lashes. The plastic bobble brush doesn't scratch the lashes or pull out too much product from the tube. This is probably my favourite mascara of the three when it's applied initially but it is the one that can smudge on me the most-and the one that I think fades the most by the end of the day. I'm playing around with layering the Trish McEvoy over the Tarte to seal the mascara in and that does help with the smudging issue. The Marc Jacobs is the wettest formula of the three and again you need to really take time to comb through the lashes to avoid clumping. The biggest annoyance of this formula is the amount of excess product the hourglass shaped fiber wand pulls out of the tube. I always have to wipe the excess before using the wand. But I do really like the elongated feathery effect this gives to the lashes even though it doesn't add quite as much volume as the Tarte mascara. But this one doesn't smudge much on me and is easy to remove with a good bi-phase eye make up remover. The one I am most likely to repurchase (and actually already have) is the Trish McEvoy because it's so hard wearing and because I am going to the gym straight from work 2-3 times a week at the moment. Have you tried any of these mascaras?